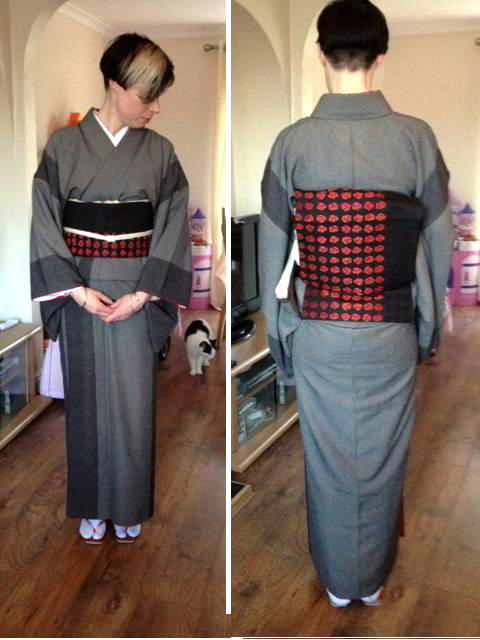 One of my customers, Ms Walker, bought some tan (bolts of textile specifically woven for kimonos, also called tanmomo) and had a kimono maker tailor them up for her. Her kimonos are beautiful and I am very grateful that she allowed me to post photos of them here. The first shows a grey one, a wool kimono, very simple and elegant. I like her choice of obi, with its broad, black band, echoing the bands on the kimono. 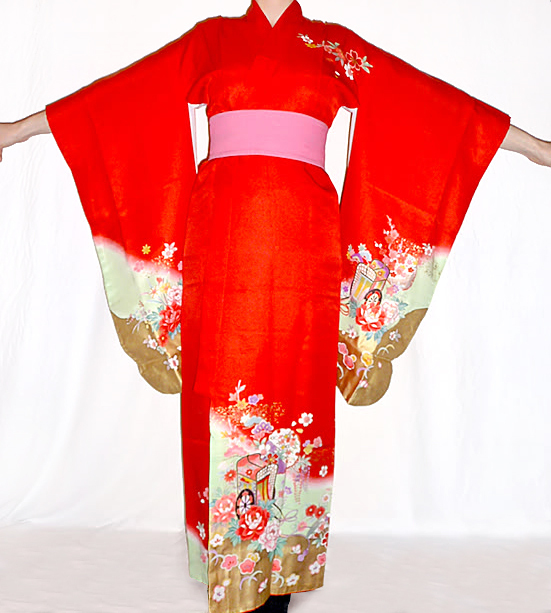 The second shows a wonderful ichimatsu kimono. Ms Walker looks absolutely stunning. 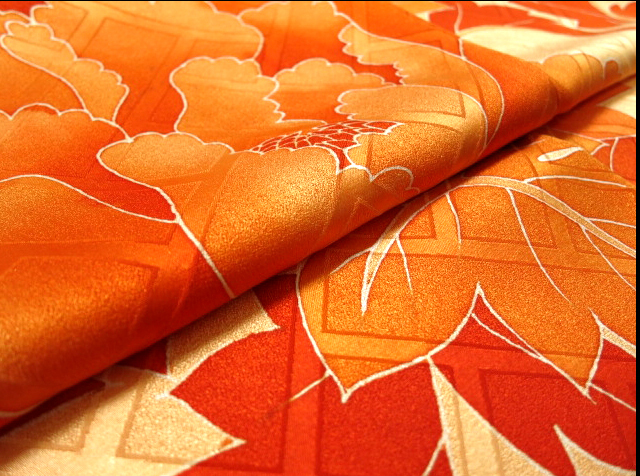 Her obi is a lovely choiceof both colour and design to go with the bold, geometric design of the kimono. 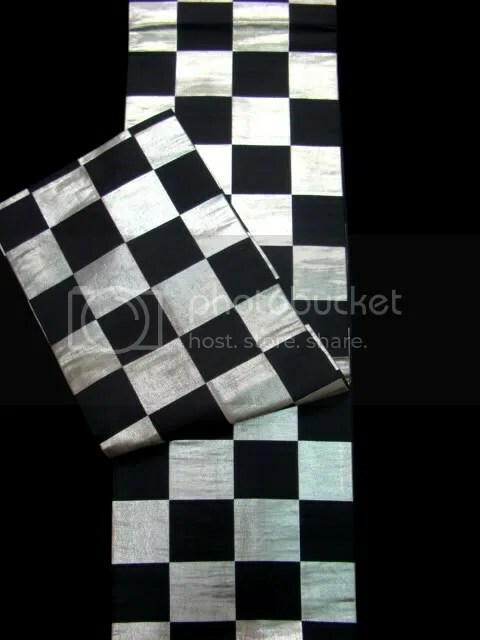 Ichimatsu is a popular design on traditional Japanese clothing; it is a checkerboard pattern, named after the kabuki actor, Ichimatsu Sanogawa, from the Edo era. When he wore hakama with thchecked design, it quickly became a fashionable pattern. It then became his trademark pattern. There is a type of doll named after Ichimatsu too, they were originally dolls that looked like him but eventually evolved into dolls of children, so we no longer think of an ichimatsu doll being one that is modelled on that actor. Many patterns that became fashionable among the general public came from kabuki actors. 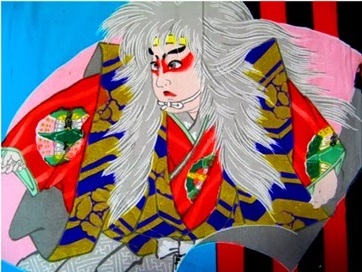 The photo below shows one of the geisha’s obi from my www.wafuku.co.uk website, with black and silver ichimatsu pattern. 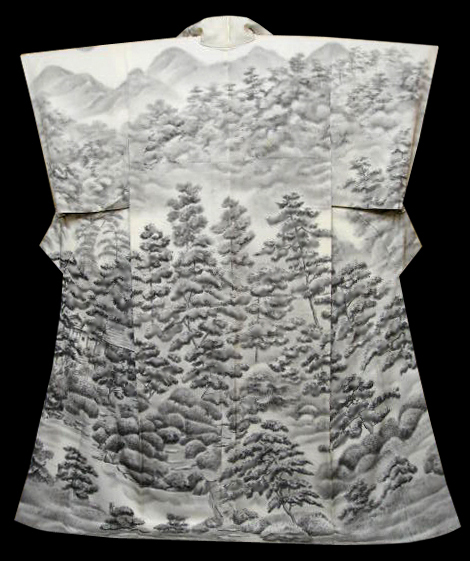 This spectacular kimono, with forest and mountain design, is a wonderful example of Japanese textile art. 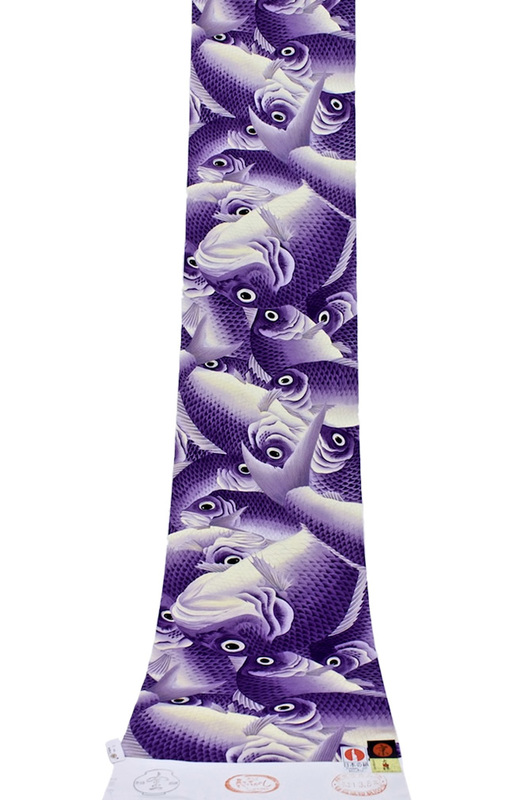 Check out this amazing bolt of silk, with huge fish (perhaps red snapper) on it. Woven to make a naga- juban, underwear kimono. 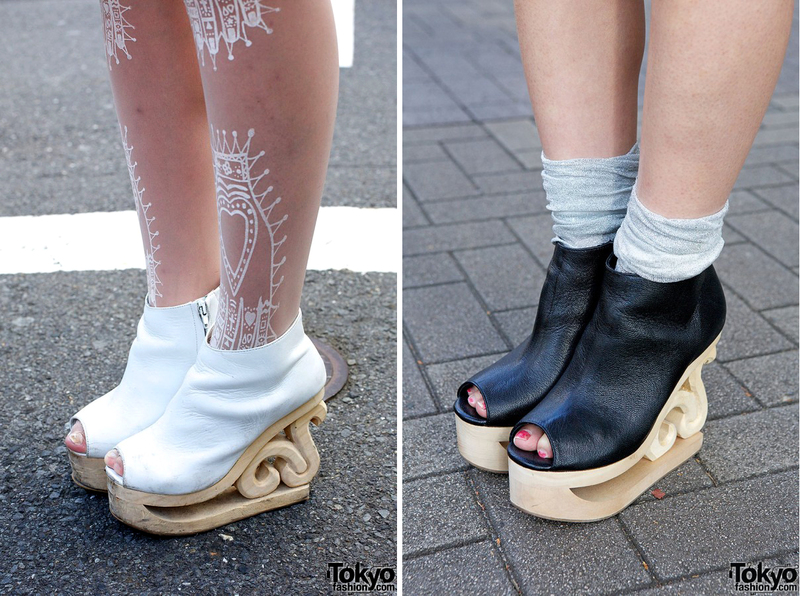 My daughter bought herself some of these Jeffrey Campbell skate booties, which are particularly popular in Japan. 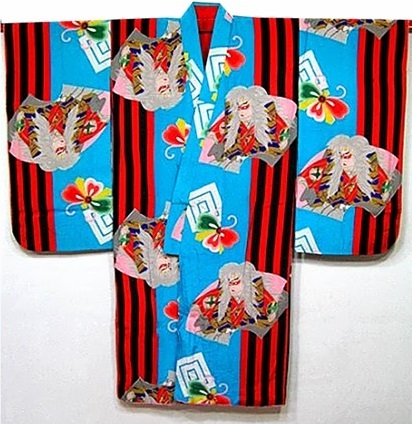 The traditional styles of wearing obis will always be correct but nowadays some kimono wearers are adding a touch of their own style to their obi wearing. They are varying the rear knots more but here I will concentrate on just the fronts. This first picture, of three women, shows the most traditional way to wear one’s obi, obiage and obijime. The obijime (central cord) and obiage (obi scarf around the top of the obi sash) are not only decorative, they help hold the rear obi knot in place. Until recently, really the only way this look was decorated was by the addition of an obidome, a piece of jewellery that the obijime was threaded through and which sat at the centre front (or slightly off centre front) of the obi sash, instead of a knot in the obijime; the obijime knot is hidden inside the rear obi’s rear knot when an obidome is worn. See an example below. Modern variations can be seen in the photo below, where the left image shows a little doll and the right shows customised buttons on the obijime. Over recent years I have seen variations on how the obiage (the soft obi scarf tied round the top of the obi sash) is worn; sometimes tucked into the collar edges of the kimono, instead of tied in the customary centre knot, and, more recently, with a shaped board behind the obi sash, showing above it, with the obiage placed over it to take on the board’s shape, as you can see in the photo below. 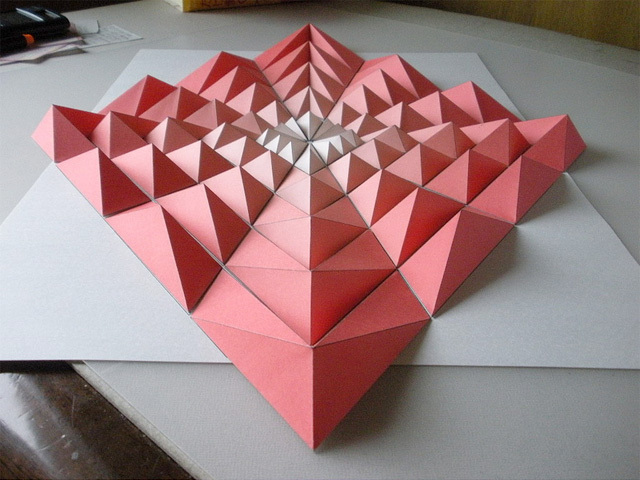 The three images show, left – folded & tucked obiage instead of tied, middle – obiage shaped over a board and, right – an obiage tucked into the kimono collar edges. Obijime (obi cord) are usually tied at centre front, in a single knot, with the ends pulled round to the sides and tucked in. Double knots have also become popular, as you can see in two in the picture above, but some women are being much more adventurous with their obijime, obiage and obidome. See a selection of creative examples below. 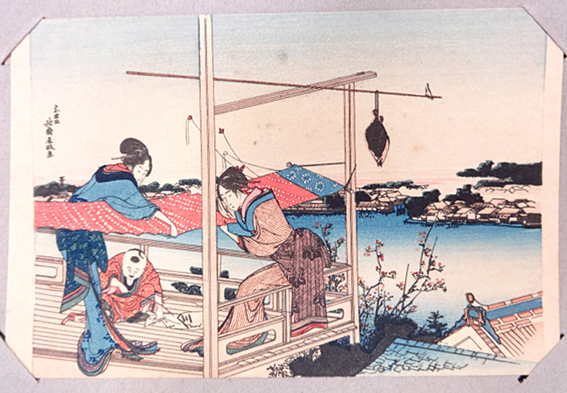 The girl in pink has various modern twists to her obi wearing; she wears two obijime, one twisted around the other, her obiage is half one colour and half another and not tied at the ends, just tucked in, and above it she has a band of green fabric with two rows of ric-rac braid on top of it. The next one has the obiage tied in an offset bow and pearls wound around the obijime, which is worn without the customary knot at the front. Next shows another with a bow tied obiage and a variation on the obijime positioning. The girl, below, in the cream kimono has fastened her obiage rather differently and her obijime is tied in an ornate, loopy knot at one side. This next young lady (kimono styling by Yumi Yamamoto) is wearing a lovely antique kimono, with a flower in the centre of her obi and a band of lace below the obi sash. Lace around obis has become very popular these days. She has another touch that is seen more and more these days, a band of stiffened fabric showing above the obi sash, below the obiage. Note too the lace edge to her han eri (juban under-kimono’s collar), showing at the neck, another recent fad. 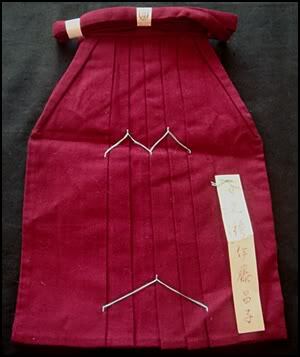 The following picture below shows the use of lace to cover the ohashori (the length shortening fold-over at the waist of the kimono), which may be done if the kimono is too short to allow the ohashidori to show the correct amount below the obi. The obiage hasn’t been tied around the top of the obi yet. The obi looks a touch pulled in by the obijime round it, this can be solved by putting an obi ita (a special stiffening board, sometimes called a mae ita) behind the sash to keep it rigid. The obi below has lace representing the obiage. The obijime below is done in a very creative way. It’s simple but very effective. 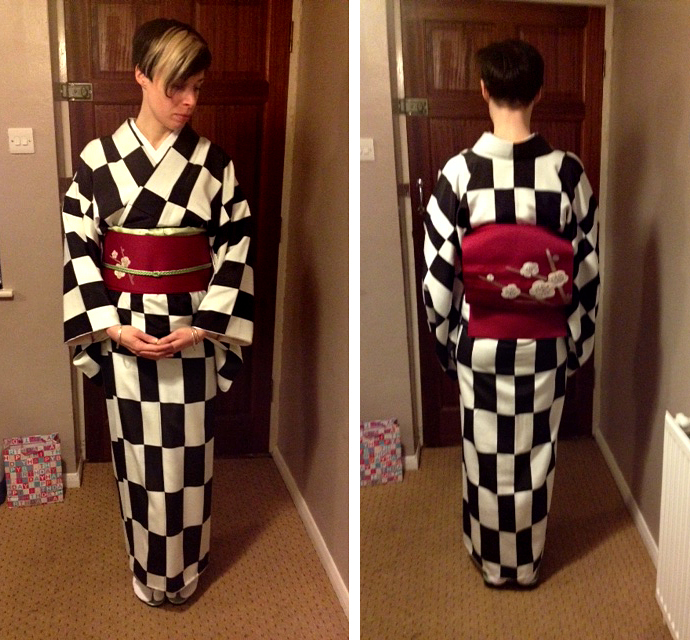 The following two pictures show 4 kimonos worn very stylishly. 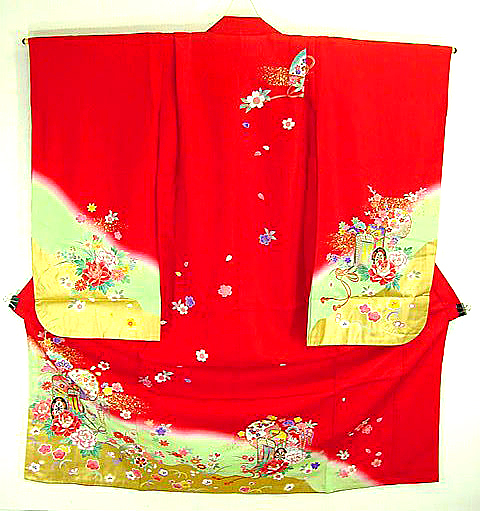 The red furisode kimono, emblazoned with cranes, has a pretty white shigoki worn below the obi and the blue one, with the stylised pine pattern, has a red, smooth obiage worn below the obi sash, as well as a black obiage at the top of it. 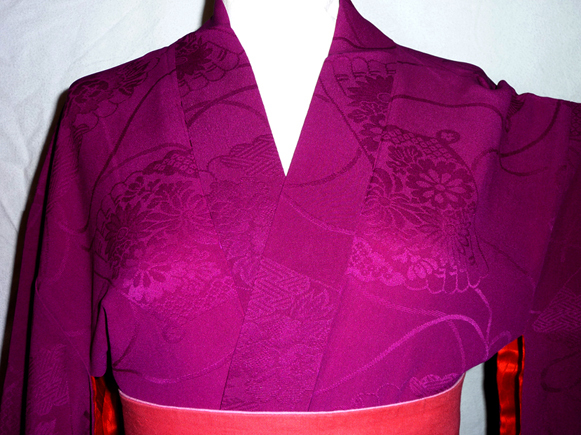 The purple one shown below has a half collar of lace plus a nice bow and drop on the obijime. 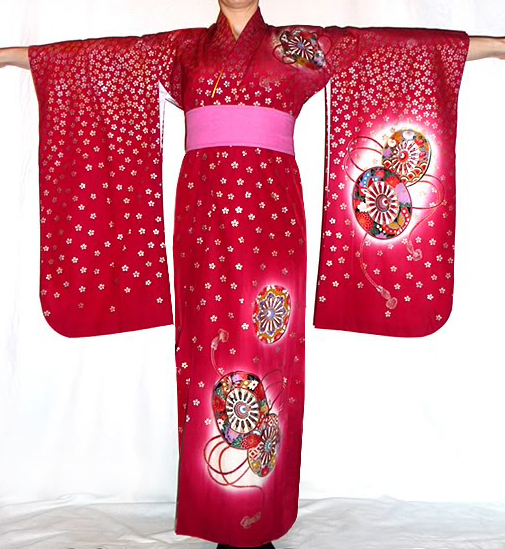 The red kimono is worn with a lovely striped shigoki below the obi. The strip of photos below isn’t as clear as I’d have liked but you can see the obi arrangement and the lace jabot at the neck of the kimono. The frilly jabot is simply tied round the neck of the kimono with a thin, white cord. She also has an interesting, very contemporary, felt hat. Here’s a nice one, from Tokyo Fashion. See how ornate that obijime is. Here is an obi with a black taffeta ruffle and a band of maribu feather on an antique kimono. I love the black and white striped han-eri on the juban beneath the kimono and the red and black date-eri on the kimono’s collar edge. Next, two obiage tied in bows above the sash, an obidome on the obijime and a pink shigoki below the obi. Another view of the one above, without the blue tint to the photo. Ok, the next one is not a human but this cat is rather cute and the bunny obidome on the obijime is delightul. The next two photos, from a designer in Japan, show kimonos that have been shortened, with the cut off fabric made into a skirt and lots of lace and ruffle edges added to the outfit plus an obi with a chiffon band around it and an informally bowed pair of obijime, giving a young, stylish look that is unmistakenly Japanese, with lots of tradition in a very contemporary style outfit. Note, in the first of the photos, the use of Doc Martin style boots along with a very traditional, white fur kimono shawl on a stand at the bottom. 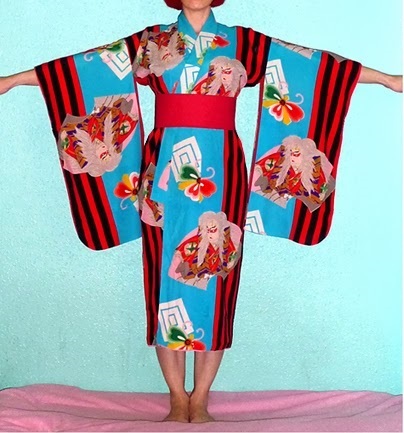 Next you can see a similar kimono outfit to the black floral kimono above, worn with a organdie sash, with a big flower at the front of the obi and a pretty organdie creation at the back. Another way to be creative with your obi is to customise the obi itself. This is not a new idea. Below you can see three antique obis that have been customised. The one on the left has hand embroidered kotoji (the bridges that hold up the strings on a Japanese harp called a koto) and the other two are hand painted in oil paints, the purple one with exquisite roses (which are not native to Japan and considered exotic) and the black one with a vase of roses and two cats. 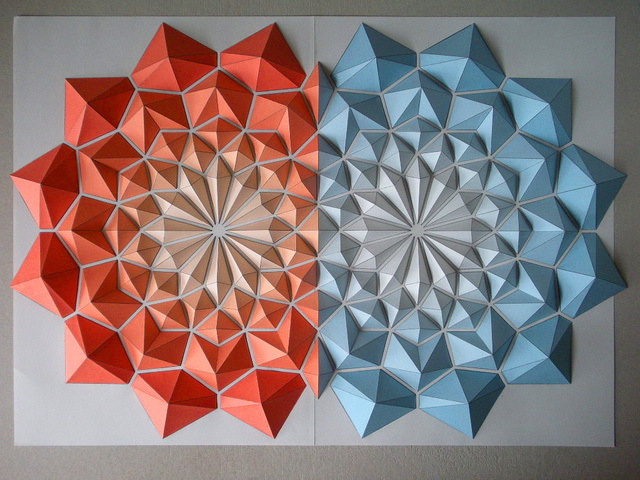 This tradition of customising obis continues and you can see some excellent examples below, with contemporary designs. This black one, by Yield-For-Kimono, is beautifully stencilled with a pair of headphones on the rear and a boombox on the front, both joined by a cable. I especially like the unexpected choice of image for an obi. Brilliant! It turns a mofuku (mourning) obi into one that can now be worn anytime and is no longer confined to use when in mourning. 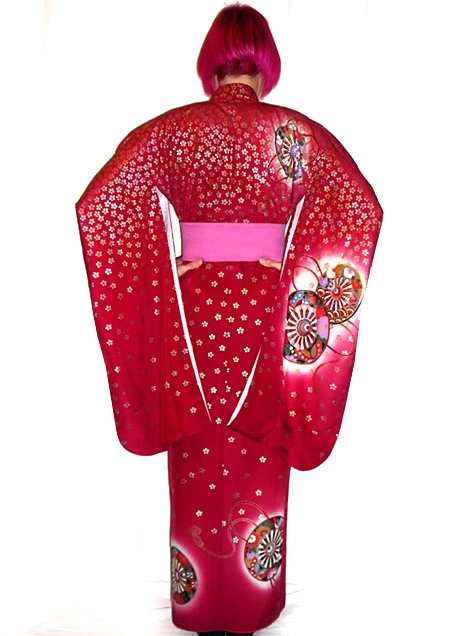 The red obi has appliqued cats on the front of the sash and on the centre of the rear bow knot. Tying the obijime in a casual bow is unusual too. The obi in the next photo is worn with the obijime and obiage the traditional way but the addition of a red shigoki sash below the obi is particularly pretty. So, when wearing your kimono outfit, you can bend the rules if you are brave and strict tradition isn’t required. Consider being creative and original and dress up your obi in any way you desire.